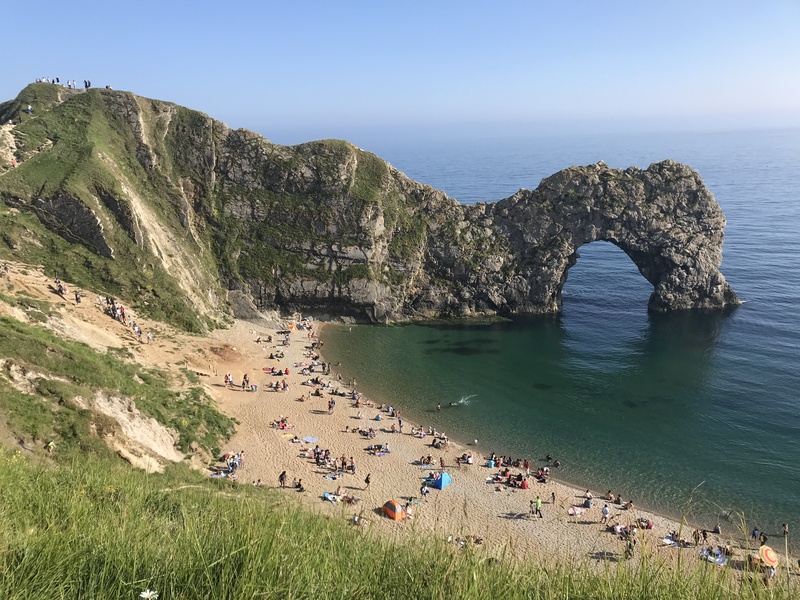 For one of our long weekend adventures we have decided to venture out to the Jurassic Coast to look for fossils and to see the famous Durdle Door. Durdle Door is a stunning natural archway made out of limestone, it is located near Lulworth in Dorset, England. We chose a beautiful day to make the trip. It was a sunny and warm day. We parked our car in Lulworth and first headed for a stroll to see the Lulworth Cove which was beautiful even though busy with beachgoers. After stopping for some food at local café in Lulworth we decided to head for the door (literally). We have taken a little detour and first hiked to Man O’War beach. It was a beautiful beach with very few people around. After this very beautiful diversion we decided to find the door. However, as we exhausted ourselves with our Man O’War hike we decided to get back to our car and drive to the Durdle Door car park. I’m not sure how much walking/hiking time that exactly saved us, we still had a fair bit to walk towards the door but the sights were worth the walk. I believe there are some places that look more beautiful in photographs. Some photographers can use their lenses and Photoshop to make places look unearthly beautiful. I was almost half expecting to be disappointed but that was defiantly not the case. The Durdle Door looked beautiful and better in real life then in pictures. I think it definitely deserves to be on the top 10 things to see in England.